OK, you’ve (hopefully) narrowed the list of to-be-visited colleges down to a manageable number. We visited one about a year and a half ago (that was the top pick for a while), one last spring (also a past top pick), one last fall, and four last week. Just off hand, don’t plan on visiting four colleges in one week unless you have a lot of energy! We will probably be visiting one more in a few weeks. If you plan to do one visit at a time, start with the most likely candidate (if there is one). If you’re going to do several on a road trip, plot them on Google maps so you can visit them in a logical order. No sense doing more driving than you have to. Again, take a look at the college websites to make sure that the date(s) you want to visit are available. Most websites have online forms for setting up visits. Some will only have tours available on certain days at certain times. When in doubt, call the college and ask to speak with the visit or tour coordinator. If possible, download a map of the campus so you can more easily find the admissions office when you arrive. Wear comfortable clothing, but don’t wear anything too scruffy. Be sure to wear comfortable walking shoes; you will be doing a lot of walking all over the campuses. Do you have an honors program? What are its requirements? Do you have work-study jobs available? How many Bible classes are mandatory? What are the visitation rules in the dorms? How is the on-campus security? Do you have a transfer program? Do you have any mini-mesters (J-term or May-term)? Copy this list, put a college name at the top of each one, then fill in the answers while you’re actually at the college. Also, have your student take notes on her impressions of the college. While we may not be too worried about the dorms, our kids most certainly will be! Have your teen write down what she thinks of the dorms, the campus in general, the distance from home (write it down), the class size, and other thoughts. Make sure you do this as soon as you get in the car to go home or go to the next college. 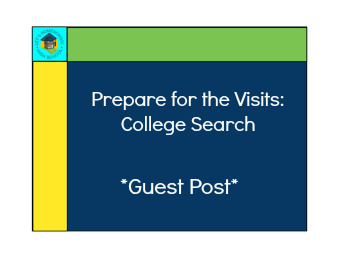 After the first college visit, they all start to blend together and you’re likely to forget which college had the dorms with the private bathrooms and which college had the best cafeteria food. As an aside, don’t skip visiting colleges just because of distance and/or time constraints. The ambiance can feel completely different when you’re actually there than when you just look at a website. That happened to us just last week. We visited a college that looked fabulous on the Internet, but the girls absolutely hated the atmosphere when we got there. It’s off the list now. Bethany LeBedz is a veteran homeschooler, professional editor, writer, and speaker; her business website iswww.bethanylebedz.com. Bethany contributes regularly to Heart of the Matter Online, has a regular column in the Home School Enrichment magazine, and occasionally writes for other magazines, websites, and newsletters. She lives in North Carolina with her family, where she enjoys music, reading, scrapbooking, sewing, genealogy, and keeping up with friends in her spare time. Be sure to follow her popular blog, Confessions of an Organized Homeschool Mom, at www.bethanylebedz.blogspot.com.